What can you put on your mugs? We’ve seen it all! Cats & dogs, best friends, families, favorite cars, flowers, vacation photos, and more. You can also add your own text in different fonts and sizes. Photo mugs are one of our most popular photo gifts. They are the perfect personal and functional gift for any holiday or occasion. We are also happy to make corporate or team mugs. You design it and we’ll put it on a mug. We use top quality mugs which are dishwasher safe! They are available in both 11oz and 15oz sizes. 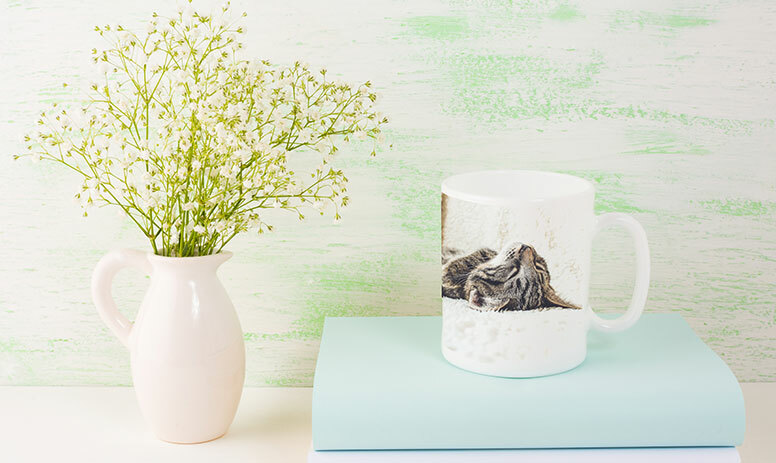 You can make your mug online using our easy-to-use web interface. Design a full wrap panorama mug and we’ll take care of the rest. Custom photo mugs are produced in-store and are usually ready in less than three days. If you need your mug shipped, we use rugged Indestructo boxes to ensure your mug arrives in one piece. The only limit to your mug design is your imagination.